How do we transcend the carbon era without completely eradicating our history? 51n4e solves this crucial design problem with their stunning C-MINE renovation in Belgium. 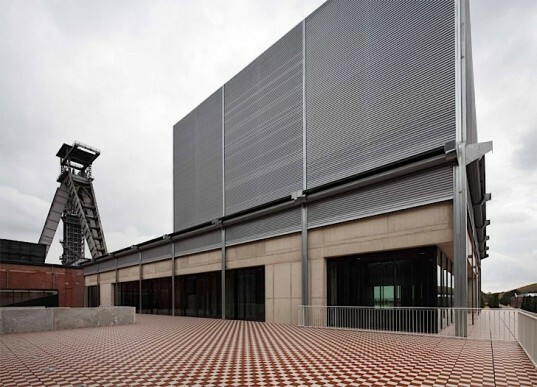 Formerly the Winterslag coal mine, the old red brick building has been transformed into a 5,000 square meter cultural center and tourist attraction. Instead of doing away with the relics that are emblematic of our sooty past, such as the large mechanical equipment, the firm chose to integrate them into the upgraded facility as a reminder of our evolution. In addition to saving materials and creating the tiniest impact on the environment, C-MINE represents the best of the old and the new. The original red brick power plant has been updated with two concrete additions, and what used to be the mine’s “nerve center” is now the heart of the C-MINE cultural center. 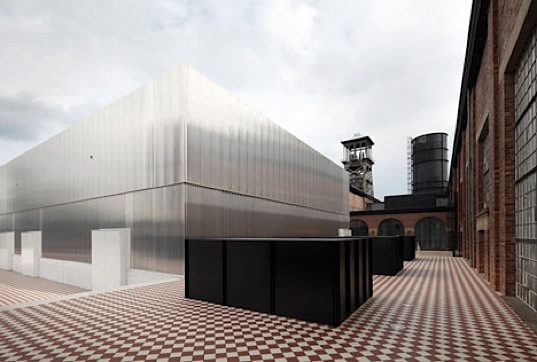 The compressor hall, lift building, and the Barenzaal were once noisy, cranking spaces – however they have been transformed into a more reflective cultural center, design center, and visitor center for tourists interested in exploring Gent’s carbon past. What 51n4e calls the “arm pit” of the T-shaped building now holds the theatre hall, a small room, and office space. Light is managed with steel grates on the outside that either permit plenty of daylight, or shut it out completely when the theatre kicks up. Part of the old brick wall forms a backdrop for the new theatre, and best of all, the existing red and white tiles have been given a bit of a polish and extended throughout this stunning converted building. The original red and white tiles are a bold statement. I too like that the designers took the 'non-earth friendly' energy site and reused to re-create a 'greener' site for tourist to visit. I know something else that is black but 'green' the Aeron Stool I can hardly believe that it's 94% recyclable! Some corrections: C-Mine is located at the mine site of Winterslag near Genk, not Gent, those cities are 150 km apart. It is also not located near Brussels; Genk and Brussels are 100 km apart. The steel grates on the outside control how much light enters the cultural center. Two new theaters are part of the newer, concrete additions to the red brick building. The architects transcended Gent's carbon past without eradicating its important history. We're so thrilled that this beautiful red brick won't be wasted. The old mechanical equipment has been restored and kept as part of the visitor center for tourists. These concrete columns were added on to the 5m foundation. The "arm pit" of the T-shaped building has been converted into a theater hall and extra office space . The 5,000 square meter facility also contains a cultural center, design center, and tourist visitor center.